I think this is a rare treat, even for those of us who have read much of Paddy’s work. 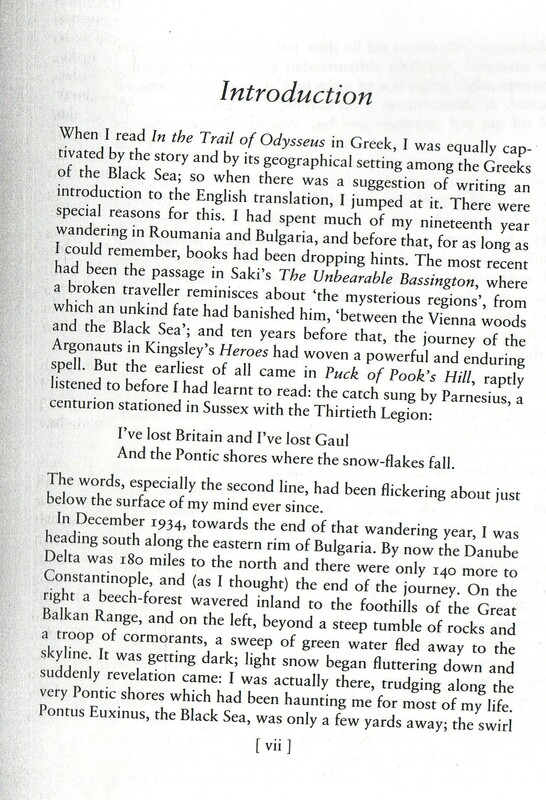 This introduction to In the Trail of Odysseus by Marianna Koromila is full of longing for the world at the edge of the Black Sea that he discovered in 1934 and which so soon was to disappear forever. It is the story of Yiankos Danielopoulis who died in 1987 at the age of 88. As a Black Sea Greek living through the 20th century his life was uprooted time after time, until at last he was able to settle in Mount Hymettos in mainland Greece in the 1950’s. I have been sent some scanned copies of Paddy’s introduction, by blog corespondent James, to the English translation to the book which I hope you will enjoy and inspire you to purchase the last few copies of the book from Amazon! To help you further, here is a short synopsis by John Colvin Body which appears to have been published in the Daily Telegraph in 1994. “In the Trail of Odysseus by Marianna Koromila tr by Nigel Clive Michael Russell, L14.95 this modern-day “Odysseus” is Yiankos Danielopoulos, one of 12 Thracian children born in Vasiliko, a whitewashed Greek village of the Ottoman Empire in 1899, and dying in Attica 88 years later. His life has been compiled by Marianna Koromila from a privately printed family record that she acquired from his daughter. It reflects the turmoil of that region in the 20th century. 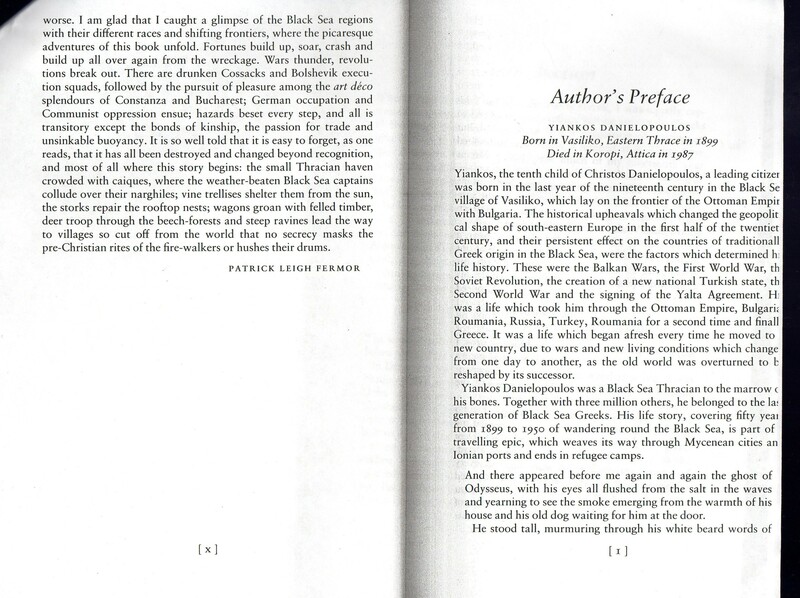 Born under the Empire, Yiankos lived in Bulgaria, Romania, Russia, Turkey and Greece, surviving two nationalities, seven homes and 13 professions, all imposed by “the gale of the world”. 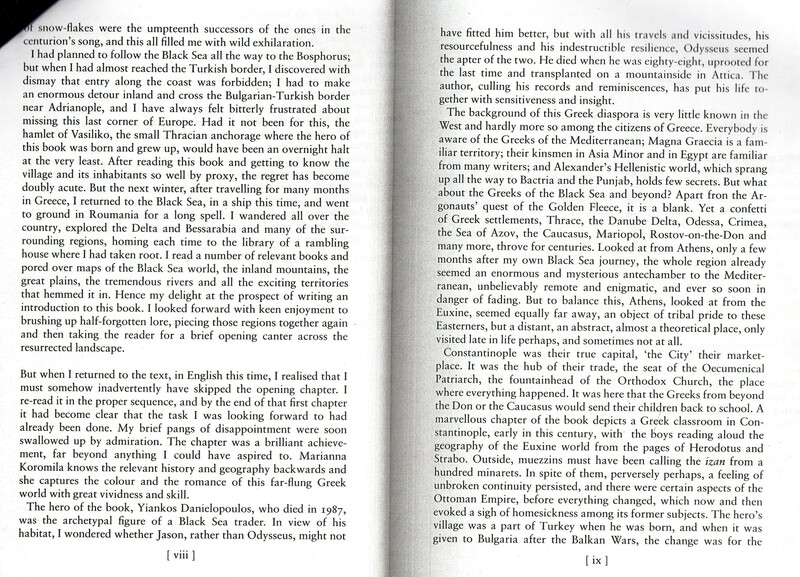 Bulgarian violence, Bolshevik revolution, civil war and Communist take-over were his Eumenides. As a child, he “listened to the rattle of the pebbles as they were washed up by the waves”; saw woods, vineyards, wheat fields and boats unloading below his window on return from fishing. The Thracian traders and shipowners, with relations in all the Black Sea ports, he described as the seagulls which followed the fish. In winter, wolves descended from the mountains, threatening the village. “Union is strength,” said Yiankos’s father when the horses drove them off. The Great Powers then changed lines on maps. Vasiliko came under the Bulgars, and life became untenable. Yiankos and his brothers moved to Constanza in Romania and opened a grocer’s shop. An admiral’s wife fell in love with one of the brothers. The shop received the navy’s warrant. Funds accumulated. Bulgaria then invaded and the family fled to Galatz (also in Romania) with their assets – 50 cases of macaroni. Yiankos dealt profitably in foreign exchange; money was made. But Galatz became an impossible place, what with bombing and Cossacks shooting holes in wine-cases and drowning in the alcoholic flood. The Danielopouloses escaped to Russia, packed like sardines in a stinking refugee train. Life in their new Russian home, Berdiansk, was lucrative until the Bolshevik and Anarchist massacres began, when the family escaped to Novorosisk in 1917, where the Russian fleet had scuttled. They steered clear of politics, which preserved them, but chaos came. The family escaped by tug back to Constanza, having profitably run cafe, shop and currency exchange in the middle of a revolution. Back in Romania, they enjoyed “party-time” – the annees folles of the 1920s – until the Crash of 1929. Thanks to family unity, they picked themselves up again, flourishing even during the German occupation of 1940. Buy In the Trail of Odysseus at Amazon. This entry was posted in Between the Woods and the Water, Other Writing and tagged Between the Woods and the Water, Patrick Leigh Fermor on October 17, 2010 by proverbs6to10.